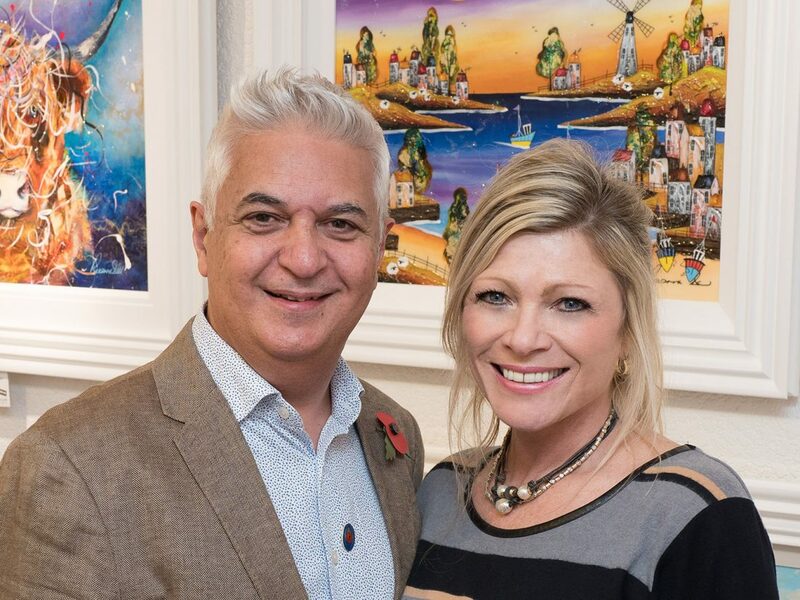 On Saturday 27th October the Harrison Lord Art Gallery in Brighouse was delighted to welcome the UK’s best-selling artist, Rozanne Bell, to open an exhibition of her latest paintings. Her wonderfully uplifting paintings, always vibrant and witty, convivial and quirky made for an impressive exhibition. Rozanne came up specially from her home in Dorset to meet her many fans in Yorkshire. The gallery was packed with her fans eager to be at her first visit to West Yorkshire in 18 months and to see the exhibition which featured over 50 new original works, all displaying her characteristically colourful and humorous style. Her celebrated depictions of wild-flowers, cosy sheep-farming villages, dreamy coastlines and quaint little fishing harbours are quintessentially British and yet she uses an unprecedented use of luminous colour and the trademark resin and metallic embellishments. Focusing predominantly on the contemporary taste for naive art, Rozanne’s artistic techniques are displayed in each of her paintings, which encompass a complexity and variety of mixed media. The end result is a marvellous depth of colour and texture. The exhibition is open Monday to Saturday, 9am to 5pm until November 10th and is free to enter. For more details see www.harrsionlord.co.uk or ring 01484 722462.